MOST 2018 one-tonners ride and handle pretty much like 2008 one-tonners - badly, especially on the goat tracks that pass for Australian country roads. So it's fitting that Ford and Holden engineers, who know a thing or to about how to set up chassis dynamics for local conditions, have now made a couple that can actually negotiate a corner at speed, and even hit a pothole or two en route, without wanting to plough straight into the mulga, swap ends or roll over. Holden's Colorado, re-engineered by HSV, emerged earlier this year as the HSV Sportscat. Its chassis upgrade is focused on improving cornering responsiveness, stability, braking and roadholding at speed on the bitumen, where it now shares class handling honours with VW's Amarok V6, the best of them in standard form. Ford has taken a radically different approach. 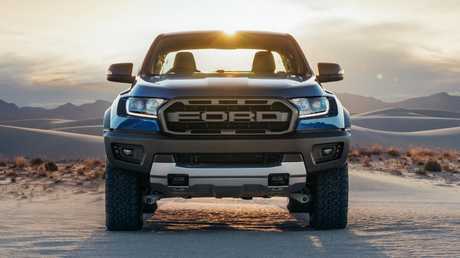 Its new Ranger Raptor handles fine on the road but in the dirt, especially on outback tracks, it is untouchable. 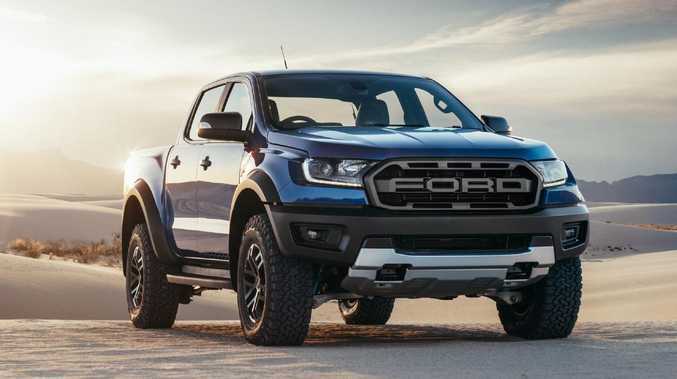 Steep ask: Ford Ranger Raptor costs $11,000 more than the top-spec Ranger Wildtrak. Picture: Supplied. The Raptor costs $74,990 - $11,000 more than the top-spec Ranger Wildtrak. You're getting much more than a few bolt-on tough-guy/go-fast bits for the extra spend, though. Stiffened with high strength steel at critical load points, the Ranger's ladder frame supports a new rear suspension and aluminium control arms at the front. On each axle, the wheels are 150mm further apart than in the ranger. There are coil springs all-round and the perfomance shock absorbers are designed specifically for high speed off-road driving. Suspension travel is substantially greater than in the standard Ranger. The Raptor rides 56mm higher at 283mm and fording depth is 850mm. At each end, vented brake discs arrest the 17-inch alloy wheels shod with meaty BF Goodrich all-terrain tyres. Heavy duty, full coverage steel bashplates are standard. Ford's new 2.0-litre twin-turbo diesel (157kW/500Nm) turns a 10-speed automatic. The part-time, dual-range 4WD features adjustable Terrain Management electronics - for fast driving on dirt, there's an aggressive off-road "Baja" calibration. 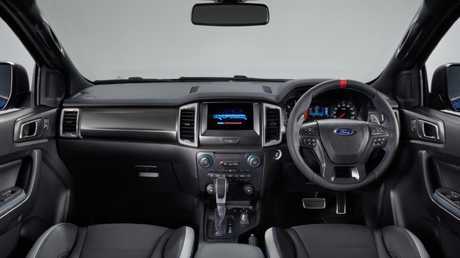 Inside, the Raptor matches Wildtrak spec, adding plush, supportive, heated sports seats, magnesium paddle-shifters and blue highlight stitching on the leather-look dash and door trims. Properly contoured, the perforated leather wrapped steering wheel has a marker at 12 o'clock so you can tell at a glance where the front wheels are pointed. The Raptor is the most off-road capable production dual-cab ute. Load carrying is not the primary brief, so the raptor is more softly sprung than a typical one-tonner. Maximum towing weight drops to 2500kg (from 3500kg in the Ranger) and payload to 758kg (from 961kg). 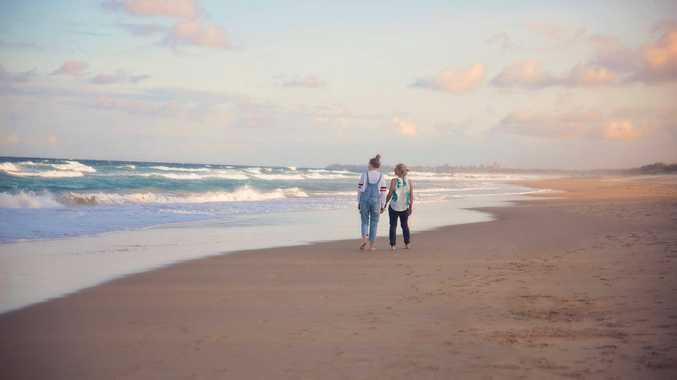 The Fox shocks are lightly damped in the initial stages of travel, becoming progressively more resistant as they work through their long stroke. In comparison with the constant jostling, shaking and thumping you get in most standard one-tonners, the Raptor's ride is calm and quiet. Big hits get nowhere near the body, which stays flat and properly tied down even as the suspension is working hard at speed on a gnarly track. It's also stable, controlled and confident, with virtually no nervousness or back-end bump steer on corrugations. At crawling pace in severely rutted, rocky terrain, it's in a class of its own for control and compliance in all degrees of articulation. The Raptor’s cabin is a pleasant space. Picture: Supplied. 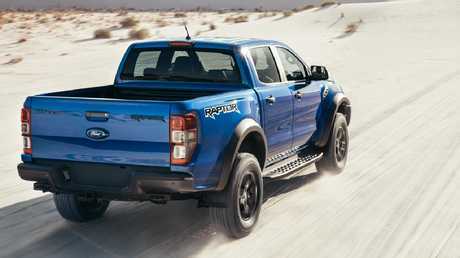 The Raptor goes without autonomous emergency braking and adaptive cruise, now standard on the Ranger Wildtrak. Ford says these will be available next year. Lane departure warning/lane keep assist are standard but I couldn't get either to work on the test car. The numbers aren't pretty: 10.5 seconds for 0-100km/h is slow, even by one-tonner standards, while 2332kg makes it the class barge. VW's Amarok V6, the Mercedes X350d and HSV's Sportscat are quicker and lighter, the Amarok by more than 2.5 seconds and 250kg. Twin sequential turbos, a tuned torque converter and tightly packed ratios give the Raptor a strong launch feel and excellent responsiveness on a light throttle. Peak torque is all over at 2000 rpm. Modest midrange performance is flattered by the 10-speed's timely, smoothly segued shifts. Our test car averaged a thirsty 10.3L/100km in 450km of mainly open road driving. Off-road, in low-range Rock mode, the Raptor does it easy, with a gentle throttle calibration and no loss of transmission refinement. A locking rear diff is standard. I pointed it at a few steep, tricky hills, pushed the relevant buttons, and it went up - and down - as if they weren't even there. At reasonable speeds on bitumen, the raptor is tidy and planted with well-weighted, accurate steering and decent brakes. In tighter corners, it can't hide its high centre of gravity. On-road grip wasn't the core brief for the tyres, either. They hang on surprisingly well on a dry surface but require a cautious approach in the wet. 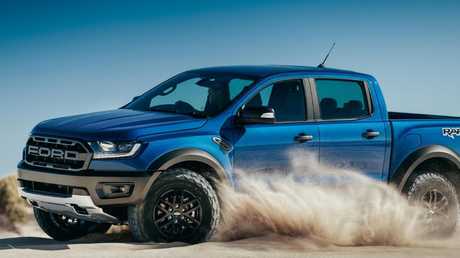 Ford Ranger Raptor has a specific Baja mode for soft sand driving. Picture: Supplied. Hey, it's big, it's bodacious, it's blue and it screams big, swinging manhood. What's not to like? It's the off-road equivalent of a Porsche 911, half the price of an AMG Merc and I won't have to pay luxury car tax or FBT. The best on-road handling in the class but you need to spend an extra $3600 on premium suspension. It shares the standard Colorado's 147kW/500Nm 2.8-litre four/six-speed auto. Tacky styling job and cramped driving position. VW is advertising drive-away deals from $58,990. Unbeatable value for a 180kW/550Nm 3.0-litre V6/eight-speed auto with the strongest performance (0-100km/h in 7.8 seconds), the best on-road ride/handling compromise and the best cabin in the class. If you're not going off-road, buy an Amarok V6 and save yourself up to $20,000. If you are, and you want the best standard production off-road one-tonner on the market, this is it. The ultimate bush truck.